I didn’t notice birds until October of 2010. That’s when I got my hands on my first Digital Single-Lens Reflex (DSLR) camera, a Canon 60D. Up until then, I’d been using a Canon 5G, more or less a point-and-shoot camera. As my friend, Christine Mack would say, the 5G is a “snapshot” camera. But I’d been happy to photograph women and landscapes with it because those are the two things I like to draw, and I was in heaven using it — until I got the 60D. After that, the 5G looked like a toy. With the 60D, I started to shoot everything and I quickly discovered that birds exist. 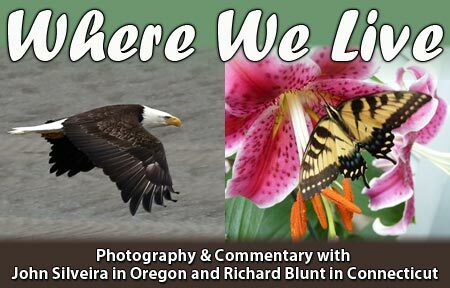 I’d never even noticed the ospreys, pelicans, or turkey vultures around Gold Beach, much less colorful little birds like American goldfinches that are all around me, but had never caught my eye. I just didn’t “see” them. 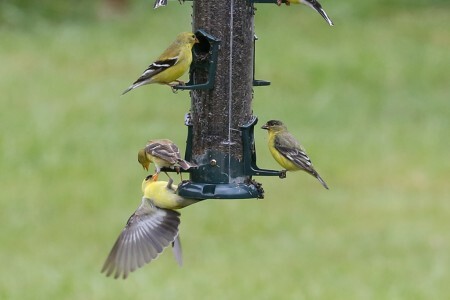 Last summer, with my 60D, I became interested in goldfinches. This year, with the Canon 5D Mark III, I’ve become obsessed. Small birds, like goldfinches, dodge and dart and, unlike large birds, need a fast wing beat to stay airborne. To “freeze” them with the camera, I settled on a shutter speed of at least 1/800th of a second. But, even then, their wing beats are often a blur to the camera. To attract them, I bought a cheap ($6.99) birdfeeder and bag of thistle seed with which to fill it. Once they discovered free eats, they began to show up in my yard in numbers. The feeder has six stations, so it will accommodate that many birds. If there are more birds, they will jostle for position. As the feeder empties, and the seed level falls below the uppermost stations, there are fewer places for them to feed and competition for the seed becomes more intense, with many of the birds hovering, awaiting their turns, and often trying to push the current occupants off the perches. Without the camera and the ability to shoot six-frames-per-second bursts, I’d never have seen what they’re actually doing and how they compete with each other. All of the photos below were shot with a Canon 5D Mark III camera using a Canon EF 70-200mm f2.8L IS USM lens. 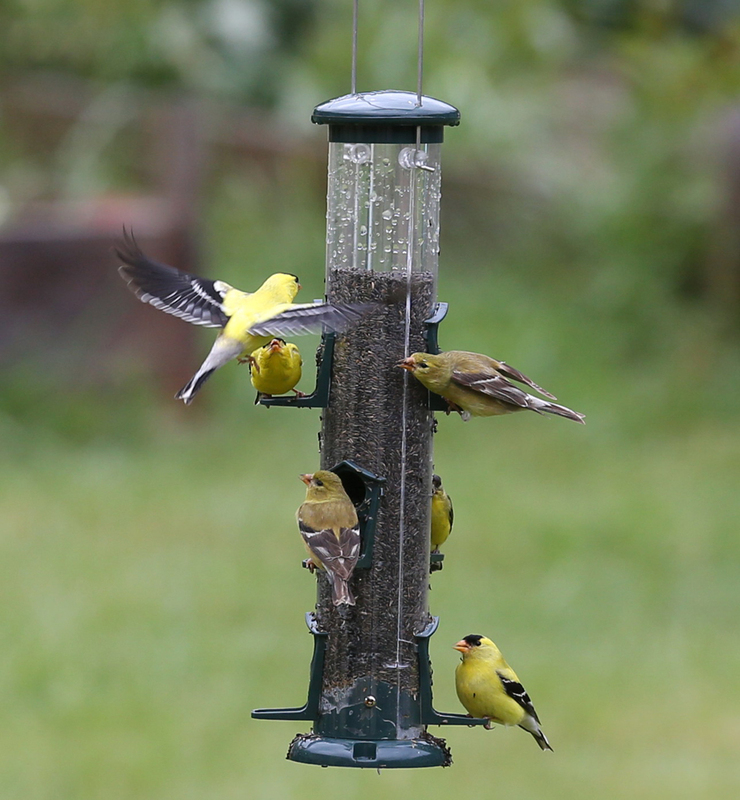 This is what the feeder looks like when all of the feeding stations are occupied. The trouble is, there are often more birds than stations and, though they’re small, the goldfinches will fight to hold onto a feeding station. The three bright birds are males of breeding age and the three dull-colored ones are females. But they all take on those dull tones in the winter. Apparently, the new arrival doesn’t realize one of the bottom stations is available and it’s trying to push the occupant of one of the top stations off. Three others are watching to see what’s going on. A bird perched at a station can usually hold its own against an intruder. In this photo the bird already on the feeder is holding on and has the new visitor more or less upside-down. 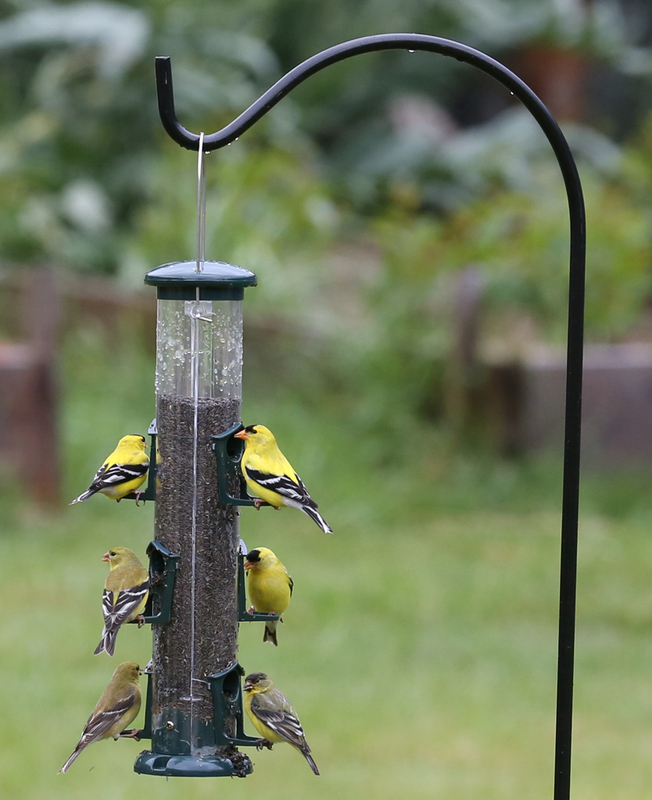 Had I never taken photos of goldfinches, I’d never have realized the drama in their lives. 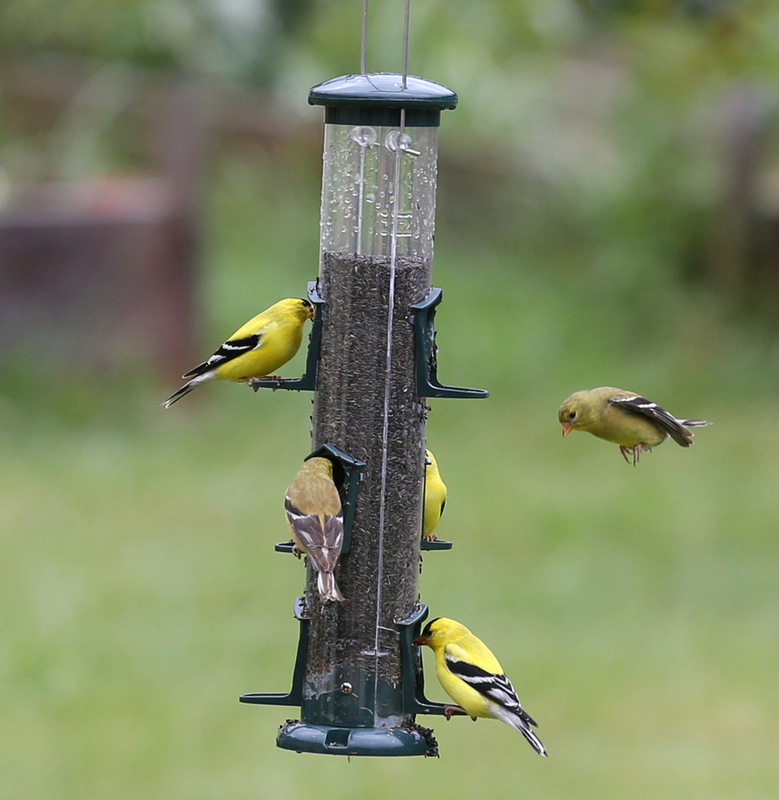 Using a fast shutter speed of pretty much freezes both camera shake and subject motion and often makes the birds appear to be floating, as the bird at the right seems to be, and not flying. From what I’ve read about them, I can expect to see them year-round. 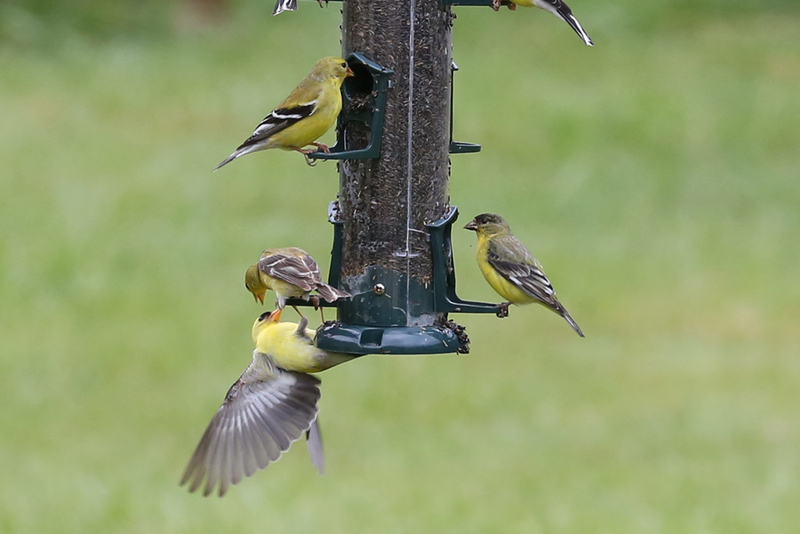 You’re going to see a lot more goldfinch photos in the future.